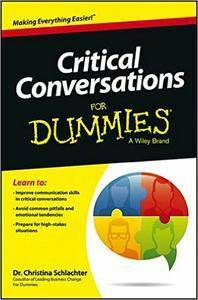 Christina Tangora Schlachter, "Critical Conversations For Dummies"
Most people are aware of the importance of handling critical conversations well. However, when it comes down to actually being in a difficult situation that calls for key communication skills, many do not know how to practically apply their own thoughts. Critical Conversations For Dummies is a step–by–step reference for the variety of crucial conversations life presents in the workforce. It′s packed with strategies for preparing for high–stakes situations; being persuasive (not abrasive); knowing the value of assertive communication; resolving failed promises and missed deadlines; maintaining morale when firing staff; getting new employees off on the right foot; managing staff relations and strengthening team relationships; understanding audience needs and motivations to get positive results; altering confrontational language to cooperative language during difficult conversations; and building relationships in the face of conflict. This book is especially relevant to the hundreds of thousands of leaders who are tasked with multiple duties, whether addressing complex problems from stakeholders or achieving exceptional results from staff.